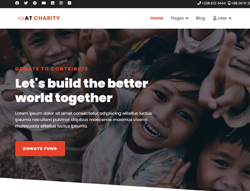 AT Charity is Premium Joomla template tailored for non-profit websites. This is meaningful template designed for all types of online charity projects which are doing something useful, helpful and constructive. Give a helping hand to those who need it. Make your sites displaying on all mobile devices with 100% responsive layout based on latest Bootstrap CSS Framework, Font Awesome Embed, K2 extended for blogging and so on. After that, it comes with 4 color styles and boxed layout helping to create great project with various layouts. Responsive Charity templates dramatically increase donations, promote key messages and make lives better for children.